ALBUQUERQUE, N.M. – If you want to see what happens if your phone falls onto concrete, you can actually drop it, or let an engineer work out the consequences in advance. Odds are you'll go with the engineer. 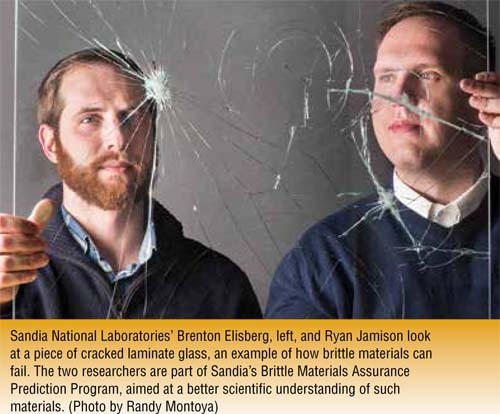 Figuring out how brittle materials inside a device behave, and fail, is one goal of Sandia National Laboratories' Brittle Materials Assurance Prediction Program (BritMAPP). The program, which started two years ago and runs until 2020, studies brittle materials in three ways: stress and loading; fracture mechanics to see how cracks start and develop; and the relationship between material properties and structure. Brittle materials, such as glass, fail suddenly and catastrophically. Unlike metals, which dent or bend if dropped, brittle materials just break. "You drop a hammer, and it might bend; you drop glass and it will shatter. It's done," said Ryan Jamison, who works with Brenton Elisberg and other colleagues on the stress and loading part of the project. They focus on how sudden failure affects the performance, reliability, and safety of components and systems where breaking has serious consequences, such as medical devices or satellites. Stronger brittle materials that can handle the slings and arrows of everyday life will benefit all kinds of devices and, ultimately, the people who use those devices. Someday, it might not be so worrisome when you accidentally drop a cell phone. Sandia wants to develop the science, technology, and understanding to assure that brittle components in high-consequence systems remain fully functional over a 30-year lifespan. BritMAPP researchers are developing mechanics models and discovering fundamental property and structure relationships so they can shift from qualitative engineering judgment to quantitative predictions of brittle material failure and reliability. Qualitative engineering judgments are decisions based on experience and comparing outcomes – A is better than B – while quantitative predictions are accurate based on the physical behavior of a material. "We want to transition from making comparisons, 'A is better than B, but we really don't know how good A is,' to making decisions based on measurable qualities, 'A is better than B because A will last for 10 years longer than B,'" Jamison said. "Being able to accurately quantify the difference is the key." While he emphasized there's much work to be done, "we're already started well down that path." Since it's not possible to test every possible scenario, researchers gather data for computer models through laboratory experiments, measuring materials properties to understand how things behave. Modelers make a computer representation of an object and then apply physical laws to predict how the materials behave mechanically: what happens when they're stretched or squeezed. "This is where modeling is valuable," Jamison said. "We can make accurate predictions of things that we just can't get data for. It can help us understand why it's failing – not just that it's failing, but what is causing the failure. We can examine things much differently than you can from a test, where you can't chop everything up to microscopic pieces and see how many parts you need to examine before you really understand." Take a cell phone as an example. "Phones are made up of plastics and glass and other types of materials. Equations govern how these materials behave and we apply those equations to those materials in the form of a phone," Jamison said. "Then we apply different environments, such as dropping your phone. We simulate that in a computer, and, through the equations that represent these materials, we can determine if the glass or other component in the phone breaks." 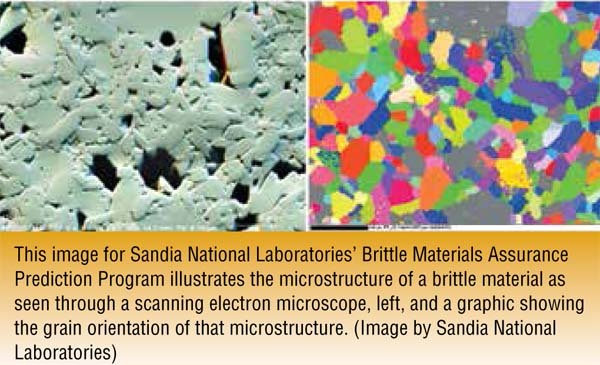 To give accurate quantitative answers, researchers must understand the stresses materials face. It's difficult to measure stress itself, so researchers measure the resulting strain or deformation. For example, they'll push a rigid tool into a brittle material and measure how cracks spread to infer the stress state. They also measure materials properties. "Those are a little easier because you're measuring the direct response from a material due to a known load that's being applied," Elisberg said. "Once we have material properties, we have more confidence that our models are accurately predicting stress. The problem is that we still need to figure out what stress is required to break the material." Thanks to more sophisticated modeling and ever-improving supercomputers, simulations have grown more complex, capturing materials behavior undetectable even a short time ago. Still, extremely sophisticated models take time to run, even with supercomputers. Last summer, Elisberg ran a simulation for 72 hours on hundreds of processors, simulating a very long series of thermal test cycles. That would have been impossible two years ago due to inadequate computer processing power and models that weren't sophisticated enough to capture the physics that interest Sandia. The team also is determining how much complexity is necessary. "If component designers just want to know is Design A better than Design B, I can tell you that quickly," Elisberg said. "If you want to know more specifically if and when Design A is going to fail, then that's when we run a more complex simulation that may run on a computer for days, but now we have the capability where we can predict or at least get a much better idea of when the design is near failure." Jamison and Elisberg work with glass-to-metal seals, components vital to sending electrical signals through hermetically sealed systems. Glass-to-metal seals are ubiquitous in everything from medical devices to telecommunications that face high temperatures, pressure, or shock. They're also important in national security uses that have much tougher survivability and lifespan requirements, Elisberg and Jamison said. "The lifetime requirement is where we're trying to go with this Brittle Materials Assurance Prediction Program," Jamison said. "Right now, we can make predictions of what would happen with these glass-to-metal seals and give qualitative guidance to designers and engineers. But we have that higher consequence application. We need to be able to say with some level of certainty that these components will last for 30 years, and have a materials and science explanation why." The next step is experiments to validate the lifetime predictions. "We believe the behavior is being modeled accurately, but it still needs to be validated in more complex applications," Elisberg said. "It's that marriage of experiments and modeling," Jamison said. "With discoveries that experimentalists have made, with advancements in the modeling that we've made, we can take that information the experimentalists are observing, put it in the models, and make more accurate predictions." Sandia National Laboratories (www.sandia.gov) is a multi-mission laboratory operated by Sandia Corporation, a wholly owned subsidiary of Lockheed Martin Corp., for the U.S. Department of Energy's National Nuclear Security Administration.